ABBY MARTIN:	Since Trump took power, activists are seeing a disturbing escalation in state repression against civil liberties, most notably, the case of the J20, where over 200 protesters and journalists mass arrested at Trump’s inauguration are now facing years, even up to decades in prison. To learn more, I spoke to lawyer Mara Verheyden-Hilliard, head of the Partnership for Civil Justice Fund, who’s been defending protest rights for over 20 years. I started by asking her to explain the details of this shocking case. MARA VERHEYDEN-HILLIARD:	So, on the first day of the Trump administration, on inauguration day, there were tens of thousands of people who came to Washington to demonstrate their opposition to the incoming administration. That included a massive rally along the parade route itself where at large portions, the demonstrators against Trump completely outnumbered those who came to support him. But additionally, there were demonstrations that took place away from the parade route. There was a march that was marching through the streets of Washington D.C. against the Trump administration. Now, some people who were marching alongside that group broke windows, engaged in property destruction. But what the police did is they followed that march by their own account. The police account is they followed the march for approximately half an hour in which they witnessed people undertaking acts of property destruction or criminal acts but they didn’t arrest the people when they saw them doing that. They waited till an arbitrary time and place and did a dragnet arrest, a mass encirclement, of 200-plus people who were in proximity and swept them all up and charged them all with riot offenses, conspiracy charges. That included demonstrators, journalists, passers-by, anyone who was arbitrarily in this location at this time and place. They’ve gone forward with these prosecutions, getting a superseding indictment and people are being threatened with decades in prison, decades in prison because they were in proximity to someone else who broke a window. ABBY MARTIN:	Mara, is it true that more charges were actually added later and piled on? The glue that holds people in, the glue that government is using to hold people together and charge them with crimes is not that an individual broke a window or committed an act, it is, for the vast majority of people, that they were near someone else who broke a window or committed allegedly a criminal act. What that is is the First Amendment, the proximity to someone who had a shared political view, being the basis to prosecute. So, what the government is saying is that if you are in a demonstration and you have a shared First Amendment political view, opposition to the Trump administration or anything else and you are marching and someone else in the demonstration commits a criminal act or an act of property destruction, the government is asserting they have the right to arrest everyone in proximity because they were nearby and say that they are part of a riot or part of a conspiracy. ABBY MARTIN:	You’ve covered unjust mass arrests, of course, for a long time. Is this different? Does this set a new precedent? 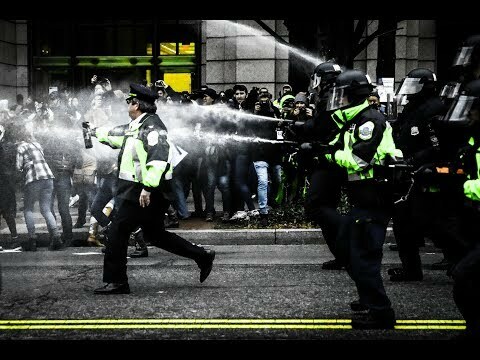 MARA VERHEYDEN-HILLIARD:	What we can see with this, in Washington D.C., is a major shift in policing tactics, a shift back to a period a couple decades ago when when you were out in the streets at demonstrations in Washington, you had a very significant likelihood of being subject to mass arrest or to brutality. My organization, the PCJF, undertook a series of cases that we litigated challenging the police tactics in Washington, including two very notorious mass arrests where, in one, 700 people were swept of the street, in another, 400 people. They were hogtied wrist-to-ankle, held more than 24 hours in stress and duress positions, completely illegally mass arrested. The outcome of those cases included not only more than $25 million in damages to demonstrators who were brutalized or mass arrested in Washington but major changes in the law of the District of Columbia and in police training, in which we shifted the balance in Washington so that people can come here, they could protest, they could speak their mind without being subject to false arrest and brutality. What’s happened with the first day of the Trump administration is the chief of police here and the police department and the Mayor’s Office that’s standing alongside are clearly rolling back those basic rights. They’re giving a green light to conduct this kind of mass arrest. ABBY MARTIN:	It truly was surreal to be covering the inauguration and see just the inability to even get past that first barricade. I mean, there was thousands of people funneled very slowly and just arbitrarily shut off from even getting to the designated protest zone on the parade route. Mara, what about the journalists? I know that some charges have been lifted off of one of the journalists who was there. But if I’m not mistaken, a journalist is still facing 70 or 80 years in prison. MARA VERHEYDEN-HILLIARD:	The fact that the government mass arrested journalists among others to begin with says everything about the nature of this sweep because if a journalist had in fact engaged in conspiracy or riot, being a journalist wouldn’t exempt them from criminal prosecution. But it shows what the government did was a dragnet arrest and they took anyone that was nearby. After the fact, the government is trying to extricate probable cause and trying to then hold people and say, “This person did this,” or, “This person was standing was here,” or, “This person was nearby,” or, “This person was chanting political slogans against capitalism, so therefore it shows that they were part-and-parcel of a riot and illegal activity.” The issue isn’t what the person’s official designation should be, it’s what the act was. The journalists who are having the charges dropped says everything about all the other people who are not having their charges dropped, who were similarly present, the journalists for the fundamental free speech right of being able to engage in First Amendment coverage and others for the fundamental free speech right of being able to protest. There are journalists who are still being held in and who are still facing these charges. ABBY MARTIN:	It could create a really, really disastrous, chilling effect for journalists, Mara and it’s going even further. Of course, as we’ve found out, the Trump administration’s Department of Justice is now ordering the server, the host service that simply hosted disruptj20.org to turn over over a million IP addresses. What do you think they’re gonna do with this information? MARA VERHEYDEN-HILLIARD:	Again, going back to the idea that they’re trying to create probable cause after the fact. The idea with probable cause is in order to arrest someone without a warrant, you have to have probable cause that a crime is being committed or been committed. Here, if they arrested all these people, they should have the evidence necessary to prove that these people engaged in a riot or a conspiracy. But in fact, what they’re doing is they’re trying to now seize all of the communications, the visits to an organizing website of that demonstration, and from that, go through those materials and try and pull out information that they can attach to defendants to try and prosecute defendants who were present. With these indictments, with the court upholding so far the right to charge people with riot and conspiracy offenses that truly turn on the fact that people had shared political views, not acts, is so dangerous as we move forward into this era. ABBY MARTIN:	What would this mean if the charges actually went forward and everyone did go to prison for the time that they’re being threatened with? MARA VERHEYDEN-HILLIARD:	What it means for all of us is that if we’re participating in a demonstration and we have no intention of engaging in anything that is unlawful but someone else in that demonstration, be it a demonstrator or frankly a police agent provocateur, engages in a criminal act, window breaking, property damage, what the police wanna be able to do is arrest everyone who was present and say, “Well, you were there and you didn’t disband your political demonstration in the face of someone else conducting a criminal act,” or you didn’t leave or you were just in proximity and therefore you must be a supporter. ABBY MARTIN:	It’s amazing that we see the Democratic Party calling itself the Trump resistance, you know? Yet, I have not heard one Democratic Party leader nor representative actually, even mention the J20 arrests. Why do you think that is? MARA VERHEYDEN-HILLIARD:	I think the J20 arrests, as they occurred and as the press covered them here in Washington D.C., the mainstream press was extremely supportive of the police chief, extremely supportive of what happened. There is ample footage being played on TV over and over again of windows being broken, of a limousine being set fire. The problem with all that is it speaks nothing to the real danger of what’s happening for all the people that were participating that didn’t break a window, that didn’t set the limousine on fire, but were engaging in expressive activity but happened to be out at that demonstration on that day when other people undertook these acts. The police and the way that they’re pursuing this action, again, is guilt by association, and the association is the lawful portion of the activity. It’s notable that this was the first mass demonstration that occurred under the leadership of the new police chief, Peter Newsham, who had just been appointed interim police chief and has now been confirmed as the chief of the District of Columbia. Trump didn’t pick him, the Democratic mayor of the District of Columbia picked him. ABBY MARTIN:	Mara, in the wake of Charlottesville, the Trump administration did a lot of things, right, conflated the left with Nazism, said Nazis were good guys, but then designated ANTIFA or at least put it out there that they’re a domestic terrorist organization now and even warning of, now, more domestic terrorist operations from this group. Talk about just the history of criminalizing a group like this. MARA VERHEYDEN-HILLIARD:	In the cases that we’ve brought over the years since Seattle 1999, we’ve seen in the course of litigation and documents that we’ve uncovered or Freedom of Information Act demands we’ve made that the government has routinely pointed to the anti-fascist movement, to anarchists, to black bloc, as in the context of being domestic terrorists or being a threat such that, in many ways, it’s really a box-checking exercises because it gives license to federal law enforcement and local law enforcement to act against organizing movements, to act against demonstrations. For example, after Seattle when there was a massive anti-globalization demonstration here in April 2000 that we ended up litigating extensively, the police were over and over again pointing to the threat that the anarchists were coming. That was the basis that they were using, the excuse they were using, to repress the demonstration, to try and shut it down in advance, to conduct preemptive mass arrests, closures of meeting spaces. I think that what we’re hearing right now, the idea that ANTIFA is being designated a domestic terrorist organization, it’s unclear whether or not there is a formal designation. It’s not clear if that is actually in existence. But no matter what, we know that law enforcement, FBI, Department of Homeland Security, are pointing to ANTIFA as an excuse and a basis to go after the social justice movement that’s standing up against true domestic terrorists, Nazis, Klansmen, people that have a long history of actually engaging in terrorist operations against Black people of the United States, against Jewish people. It gives law enforcement, and frankly the Trump administration, a way to try and skirt the real issue here, which is that you do have a resurgence of terrorist organizations, of white supremacist organizations, but it’s not ANTIFA. I think that’s also why we’re seeing this kind of leaked discussion that ANTIFA’s being targeted as a domestic terrorist organization. It gives the press and the Trump administration, others, a basis by which they can write articles and try and put an equal sign between those that are anti-fascist and trying to stop terrorists and the real terrorists. ABBY MARTIN:	In fact, there’s been more articles condemning ANTIFA than condemning the neo-Nazis. MARA VERHEYDEN-HILLIARD:	Even with our work about the Occupy movement and Black Lives Matter movement, it bears noting that in the documents that we got, in the many thousands of pages of documents, we have the FBI, Homeland Security, all these other intelligence and law enforcement agencies actually targeting those movements, Occupy particularly, a peaceful Occupy movement, under domestic terrorism authority. ABBY MARTIN:	It seems like a really slippery slope because, let’s say the FBI raids your house and finds something with an anarchist symbol on it. I mean, where does that end? How can you designate who is and who’s not ANTIFA? MARA VERHEYDEN-HILLIARD:	It gives the government license to do a lot that they might otherwise feel some constraint about doing, to the extent that they have ever felt constraint about going after a social justice movement. It’s almost a type of gang designation for them because then they can point to ANTIFA, say that anyone that’s affiliated with it or that they assume is affiliated with it is therefore potentially engaging in domestic terrorist or criminal activity. It allows them to try and open investigations. It allows them to engage in surveillance operations. But, again, I’m not really sure that they have ever held back from doing that with a social justice movement on any level whatsoever. ABBY MARTIN:	We also learned from Charlottesville and the tragic death of Heather Heyer, of course who was run over by a neo-Nazi in his car, that it’s not just neo-Nazis who are encouraging to run over protesters with their cars. It’s police, right, it’s actually generic Conservatives. Not only that, it’s lawmakers essentially legalizing or codifying this activity. Various states have tried to propose legislation that makes it legal to run over protesters if the person says that they didn’t mean to, right? North Carolina, a portion of the North Carolina representatives just passed a bill such as this. I mean, can you talk about this front of the assault? MARA VERHEYDEN-HILLIARD:	Coming from legislatures around the country, and about half the states so far and there’s approximately 35 or more bills that have been introduced, to criminalize political protest activity, and those include bills that would exonerate drivers that run over people who are engaged in demonstration activity if those people are in the street. There are bills that would seek to charge demonstrators for the cost of the police actions against them. There are bills that are across-the-board trying to take what were traditional sort of civil disobedience misdemeanors, nonviolent actions that people might engage in, and turn them into felonies so that they could charge people and try and hold them in jail for decades or have them fined hundreds of thousands of dollars. This is clearly an effort from legislators to try and stop the Black Lives Matter movement, to try and stop the Environmental Rights movement. Looking at what happened with the pipeline protesters or the demonstrators in Standing Rock, they’re really acting at the behest so often of the fossil fuels industry and these legislators who shamelessly, just writing legislation that frankly is just facially unconstitutional. I would expect many of these new laws, those that get passed, to be challenged. ABBY MARTIN:	The Trump regime may be ramping up brutality and criminalization against protesters but this certainly didn’t start with Trump. This has been going on for a long time. Under the Obama administration, how did civil liberties fair? MARA VERHEYDEN-HILLIARD:	Well, I think it’s true that the Trump administration has certainly told the police that they have a green light and has told prosecutors that they have a green light and is putting in prosecutors, and supporting them, that will take the most draconian measures against demonstrators. But it didn’t start with the Trump administration. Historically in the United States, every time that you’ve seen a resurgence of a social justice movement, we have always seen a concomitant rise in police repression and green light given to the police, both local and federal law enforcement agencies. You can see that through labor rights movement, the Civil Rights movement, the anti-war movement. Under the Obama administration, that’s when all the material was created that we were obtaining over the Occupy movement. The documents we have had virtually every federal law enforcement agency engaged in some measure of monitoring, surveillance, disruption actions, yet 7,000 people who were swept off the streets of this country and charged because they were engaged in the Occupy demonstrations, a concerted effort to crush a movement, that’s under the Obama administration. So I think it’s an error for people to just look at Trump and say that he is the origin, he is the source. The fact is any time that there is a movement in the United States that’s challenging the establishment, that’s challenging the Democratic Party and the Republican Party. In that way, they both unite when it comes to an effort to shut down this kind of real grassroots movement. Now, the Democratic Party is gonna work to try and co-opt any grassroots movement, give some appearance of embracing it, and try and bring people basically into the voter rolls. But they too have no desire to see substantial social change that would truly alter the direction of the country. ABBY MARTIN:	Activist today may not understand the sordid history of COINTELPRO in this country and what it did to the left. Talk about the extent of the operation, the tactics, and who it was targeting. MARA VERHEYDEN-HILLIARD:	The COINTELPRO Program, which is the Counterintelligence Program of the FBI, and as well the CIA had a program, had CHAOS, these were these initiatives by federal law enforcement using ostensibly their charge to stop crime in the United States to act completely as mechanisms of social and political control. What these programs did, the COINTEL Program did, is it went after the social justice movement. It went after the Black Liberation Movement dominantly. It went after the anti-war movement. The way that they acted against the movement and these movements is through major covert operations where in addition to the overt attacks by the FBI, murdering Black Panthers and attacking demonstrations, there were covert operations where the single focus was disruption, to destroy social justice organizing from the inside-out. They went into organizations, they infiltrated organizations, and the goal was to sew division, not merely to go in and report back but to actually actively try and destroy what people were doing and to try and destroy groups coming together. There was a strong effort, a documented effort, to try and keep, for example, the Civil Rights movement from joining together with the anti-war movement. The effort throughout the United States was to divide groups from each other, to divide groups from within each other, to try and create even false claims and attacks from one group to another group so that groups would be pitted against each other. It’s an extremely effective way to try and destroy organizing. I think right now, everyone who’s engaged in organizing at this moment in time, when you see something building that is becoming powerful, that is becoming successful, that is drawing people in, we should know with certainty that the law enforcement institutions in the United States will once again and probably are once again already trying to create disruption efforts by going in, dividing, seeking to create fissures within organizations and among movements. It’s something that, while I think that people should not spend their time looking over their shoulder or worrying about the person sitting next to them at the organizing meeting, people just have to be smart about what’s actually going on and what they see and really think through things when they see something coming or see efforts at division among people that really should be standing together, should be able to unite. People can have political differences and have discussion and debate, but when you see an effort to completely try and crush someone that you know is doing social justice organizing, you have to question it. ABBY MARTIN:	From Standing Rock to Black Lives Matter, why do unarmed progressive groups face so much more repression from the police than armed right-wing groups? MARA VERHEYDEN-HILLIARD:	Well, it’s true that the social justice movement, the left, it’s an unarmed, nonviolent movement. You have a couple windows broken and the government acts as if that is the epitome and definition of the movement overall and also as if that’s a level of violence that is equivalent to the terrorist violence of the Klan and the Nazis. When the right-wing comes to demonstrations and they come armed, the government stands back. When the left comes to demonstrations, when social justice organizers come and they are unarmed and they are nonviolent, the government feels great license to come in and crush those movements. I think it’s plain to most of the left that were they to show up with guns at any demonstration, they would be met with significant force from the government and it would become this demonizing effort to show how violent the left is or how violent the social justice movement is. But that’s the reality of how things play out in the United States. The right-wing can walk proudly around with guns, and the left, which is really, really peaceful frankly, in the United States, is met with extreme repression. ABBY MARTIN:	Why do you think that is? MARA VERHEYDEN-HILLIARD:	Well, the government has a desire to shut down those that are actually challenging the establishment. I mean, that’s the focus of it. Armed or unarmed, if the left was armed, it would just give great incentive to the government to probably engage in extensive prosecution’s, conspiracy charges, and really go after the movement in a whole different level. But when the right-wing conducts itself this way, the right is not challenging the establishment in the United States. The right is very frequently trying to roll things back to a different period, but it doesn’t pose the type of challenge to the social order in the United States that true progressives do when they’re demanding societal changes, when they’re demanding equality. They’re challenging the political institutions. They’re challenging the economic institutions. The right-wing is challenging nothing. They simply are trying to impose a racist, misogynist agenda and social order that people in this country won’t accept.